Bundesliga | Bayern Munich midfielder Arturo Vidal: Enforcer, warrior and... goalscorer? Bayern Munich midfielder Arturo Vidal: Enforcer, warrior and... goalscorer? 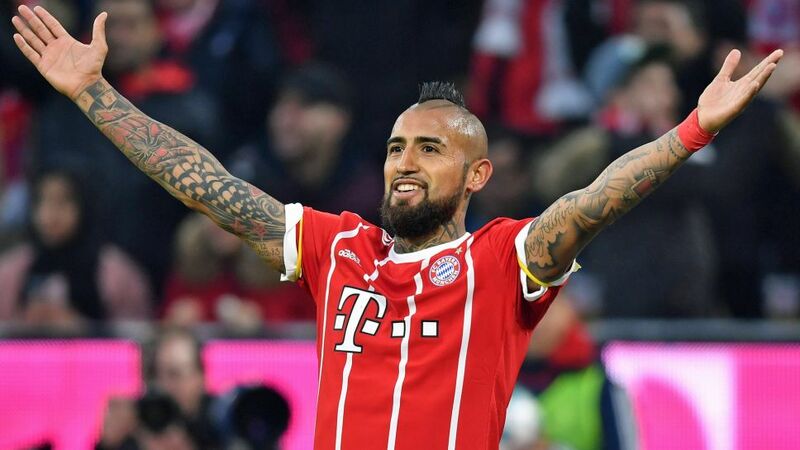 Just when you thought no more strings could be added to Arturo Vidal's impressive bow, Bayern Munich's Chilean midfielder goes and adds another. His goal in Bayern Munich's 5-2 victory over Hoffenheim on Matchday 20 – a result which earned the Bavarians a 16-point cushion at the top of the Bundesliga – was his sixth of the current season, making it already his best haul in a Bayern shirt and just four shy of his single-season best with Bayer Leverkusen in 2010/11. There are still 14 games left for him to match or better that mark, and it would be no surprise if he were to celebrate his 31st birthday in May with another double-digit tally for the season. Head coach Jupp Heynckes has played no small part in that. Since the veteran tactician replaced Carlo Ancelotti, Vidal has found the back of the net five times in 12 Bundesliga outings after returning to a position where he can do most damage, just slightly further forward than he had been under the Italian. Being such a consistent performer was not something the former Juventus man could have taken for granted, however. With plenty of alternatives – from summer signings Sebastian Rudy, Corentin Tolisso and James Rodriguez to the established pair of Thiago Alcantara and Javi Martinez – Vidal has lived up to his 'Guerrero' nickname with warrior-like ability to hold down a regular starting berth. A glance at his performance statistics from the Hoffenheim game goes quite some way to explaining why Heynckes is so keen to ink his name on his teamsheet each week. He covered 7.6 miles – significantly more than Bayern's next best endurance enthusiast Rudy (6.9 miles), and that included 88 intensive runs – again, more than anybody else on the Allianz Arena field. His 18 successful tackles were also a game high, and his 84 per cent pass completion is just another admirable figure. In short: Vidal goes everywhere and gets things done. "He's playing at a really high level again and you can always see how great he is," enthused Heynckes. "He's a player with extraordinary experience in international football, and he's always there where you need him." With Leon Goretzka arriving from Schalke in the summer, Vidal will face further competition for his place – and that from a player nine years his junior. Inevitably, speculation is growing that he might try his luck elsewhere - not that Heynckes would willingly let that happen. The 72-year-old, whose own contract with Bayern ends in the summer, had the pleasure of working with Vidal for two seasons at Bayer Leverkusen between 2009 and 2011, and although he says the player, who has a contract through to 2019, must decide his future "together with the club," he gave more of an indication as to what he would do. "I think he's an outstanding player," Heynckes said succinctly. It is hard to disagree with that assessment. With Vidal orchestrating affairs at both ends of the pitch, Bayern are well on course for another Bundesliga title. And with the Chilean hitting form at just the right time, you would not want to bet against them in the UEFA Champions League - a title that has eluded him so far. For the self-titled Rey Arturo - King Arthur - that would certainly be a worthy coronation.